These have been fun to create. I’ve been able to sit out on the deck to do the hand embroidery and beading. I’ve especially liked playing with some of my wonderful threads and fibres. I have silk from Treenway Silks, DMC floss and pearl cotton, metallic threads from Wonder Fil, some lucious hand-dyed variegated threads from Dinky Dyes, silk ribbon from Treenway and Superior Threads plus various yarns, ribbons, trims and beads. 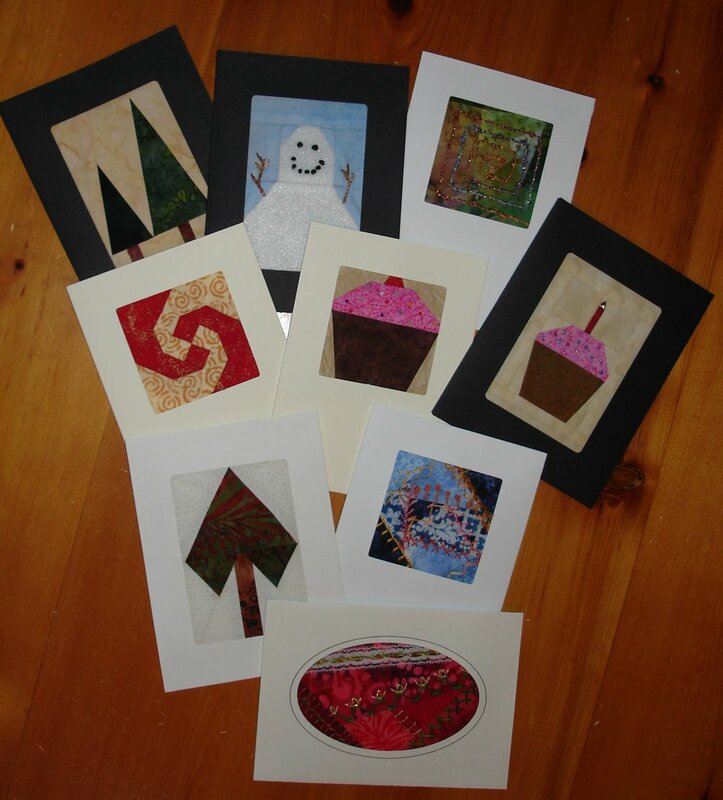 Some of these cards are for personal use, but I’m also a vendor at the Toronto East Rotary Club Craft Sale on November 17th, and the cards are one of the items I’ll be selling. Hope to see some of you there – it’s at Eastminster United Church, 310 Danforth Avenue, Toronto, from 10am to 5pm. This entry was posted in Crazy Quilting and tagged Fibre Cards, Toronto East Rotary Club Craft Sale. Bookmark the permalink. I love your fabric cards! As for your trend tex fabric… thanks so much for participating. I haven’t seen the blue yet, Judy the VP is going to bring it to me next month as the Board has 3 days of meetings. I can’t wait to get it, I haven’t planned a thing yet, good for you for using EQ7. Thanks, Jackie. This is the first time I’ve participated in the Trend-Tex challenge. I was hoping to use just the 5 fabrics supplied, but I may need to add something else, since the blue is darker than I thought. Looking at the photo again, it is a bit darker than I remembered, but that just adds to the challenge! I love these cards. They are adorable.